April Showers bring May flowers – and fresh fruit and veggies. Get outside this weekend and enjoy some of this beautiful spring weather by checking out one of these local Farmer’s Markets. You can purchase some great quality produce, meat, baked goods and more while supporting our local community. 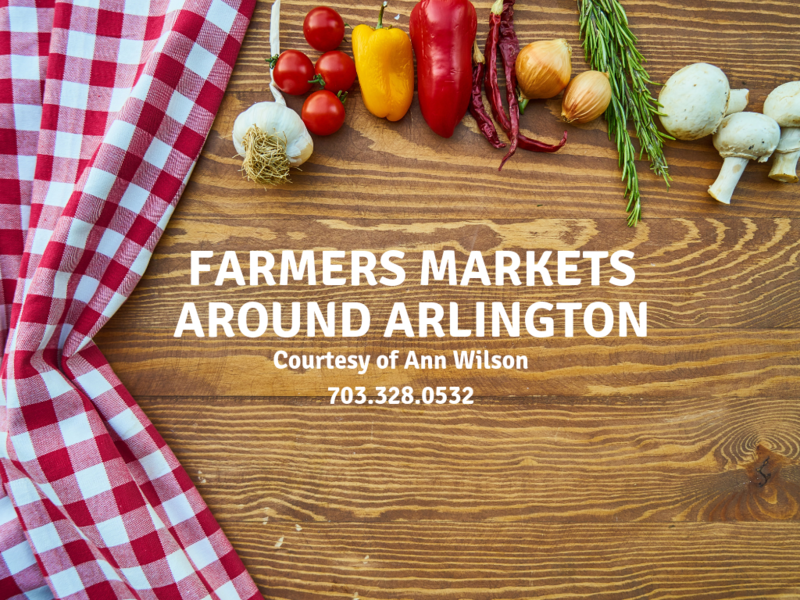 · Arlington Farmers Market – North Courthouse Road and North 14th St, Saturdays from 8am-noon year-round over 30 farmers/producers sell locally grown/made produce, meat, flowers and specialty foods at the Arlington Courthouse. Come and celebrate their 40th year anniversary on April 27th! · FRESHFARM Ballston Market – 901 N. Taylor St, Thursdays from 3-7pm offering organic fruits and veggies, grass-fed meats, pasteurized eggs, Virginia wines, cold-pressed juices and much more. On the first Thursday of each month they host Mega Market with music, a wine and beer garden and fun giveaways. · Columbia Pike Farmers Market – Pike Park: Columbia Pike & S Walter Reed Dr, Sundays from 9am-1pm May through October. We feature produce, meats, and dairy products from our region’s top local vendors. Support local farmers and entrepreneurs as you source your own fresh ingredients and products. · FRESHFARM Crystal City Market – 1900 Crystal Drive, Tuesdays from 3-7pm featuring over 20 farmers and producers from DC, Maryland, Virginia, Pennsylvania, and West Virginia. Shop for organic fruits and veggies, grass-fed meats and pastured poultry and eggs, baked goods, handmade pastas, honey, jams, and jellies, hot sauces and pickles, and delicious prepared foods. · Fairlington Farmers Market – 3308 S Stafford St on Sundays from 9am-1pm May 6th-November 18th rain or shine selling fresh produce, grass fed meats, eggs, coffee, pastries and baked goods, hot breakfast sandwiches, flowers and other prepared foods – including vegan and vegetarian! · Marymount Farmers Market – Marymount University on Saturdays from 9am-1pm May 25th-November 23rd. Marymount Farmers Market is a local producer-only market. Each of their vendors grows, bakes, roasts, cooks, or prepares all of their products within 125 miles of Arlington County. Produce is usually picked within a day or two of the market so it is as fresh as possible. · Westover Farmers Market – 1644 N McKinley Rd, Sundays from 8am-noon May through November. They also have a winter market Sundays from 9am-1pm December through April. They have around 30 vendors selling fresh produce, herbs, cut flowers, grass-fed meats, dairy products, baked goods, and other prepared foods.